Vitamins & MineralsNOW Foods Adam - 60 tabl. 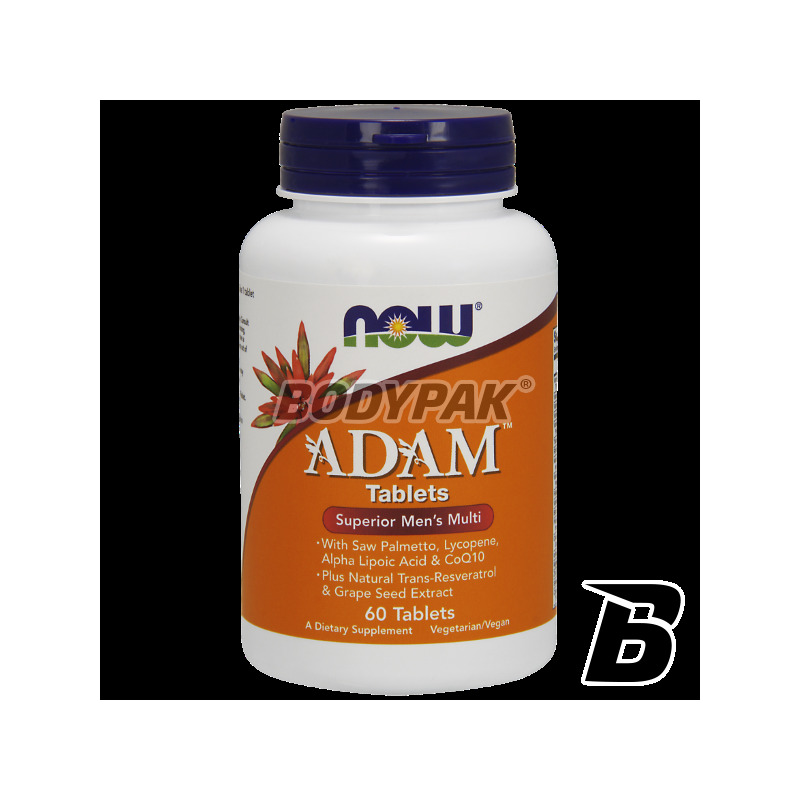 NOW Foods Adam - 120 tabl. ONE OF THE HIGHEST MULTIVITAMIN MARKET IN THE USA! MANY PATENTED ALLOWANCE RENOWNED COMPANIES IN USA! CONTAINS ALL NECESSARY VITAMINS AND MINERALS! USPRAWANIA WORK AND NERVOUS SYSTEM BLOOD! CONTAINS DIGESTIVE ENZYMES TO MAXIMUM ABSORPTION! 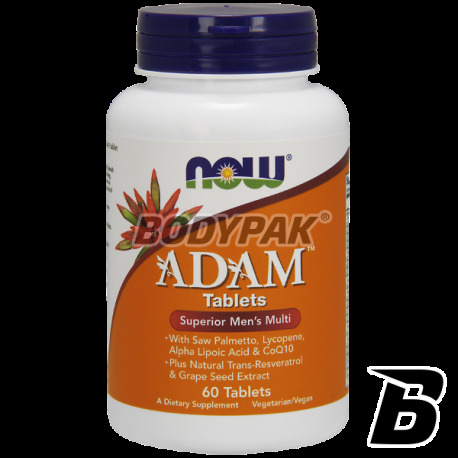 Adam ™ - this is a product that brings together all the existing formulas for men. One of the few so well polished vitamin and mineral preparations. It contains additional components that make it unique in the market in this category. - Heksanikotynian inositol as vitamin B-3 - recommended form with the best bioavailability. - Vitamin B-6 obtained from the P-5-P, a more efficient source. - Vitamin B-12 as Methylcobalamin - the most effective form of coenzyme. - Contains a patented formula of ZMA - intensifies the anabolic state of the body. 160mg Saw Palmetto (saw palmetto) - an essential ingredient for any man after 30rż. - 100mg supplement energizing Panax Ginseng (Ginseng Root) - the highest standardization of active ingredient. - 50mg jenego of the best and most powerful antioxidants known what modern science - alpha-lipoic acid. - 5 mg of CoQ10 (coenzyme Q10) and 30mg of Ginkgo biloba (ginkgo biloba) - skłdników ideal for enhancing male potency. - High saturation lycopene (optentowane Lyc-o-mato ™) and lutein - carotenoids essential for proper funkcinowania prostate and ocular. The formula without iron, which in the light of the research is not a component of the right to mężczyz after puberty. Many similar products of this class on the market actually contains ingredients that are not relevant as additives to the diet of a man active. Adam ™ formula is designed not to contain additives which do not need, therefore there is more space for ingredients that your body will use successfully for the health, well-being, vitality and satisfaction with life! Friendly product for Vegans and Vegetarians. NOTE - Copy and disseminating description and model of the label only allowed with the permission of the owner BODYPAK "Xtreme Body Trainers". Powered by: MED (Tomasz Kopeć) - BODYPAK © 2006. Zalecane dzienne dawkowanie: 1 do 2 tabletek dziennie. * dzienne zapotrzebowanie okreslone dla diety 2000 k/cal. Pozostałe składniki: celuloza, maltodekstryna, krzem, kwas stearynowy (żródło wegetariańskie), sódCroscamellose(Croscamellose), stearynian magnezu (żródło wegetariańskie), stearynian (żródło wegetariańskie) oraz otoczka. Zawiera derywaty (pochodne) soi. Nie zawiera cukru, soli, drożdży, pszenicy, glutenu, mleka, jaj, skorupiaków oraz środków konserwujących. ZMA® jest zarejestrowanym znakiem handlowym - SNAC Systems, Inc. (opatentowane) i jest dostępny od InterHealth Nutraceuticals, Inc.
FloraGLO® jest zarejestrowanym znakiem handlowym - Kemin Foods, L.C. Chromium Chelavite® jest zarejestrowanym znakiem handlowym - Albion Labs. ZinMax® jest zarejestrowanym znakiem handlowym - Nutrition 21.
polecam, najlepsze witaminy jakie brałem. NOW Foods Magnesium Citrate - 120 kaps.